It's no secret that 1970s-inspired boho textured goodness is my jam. 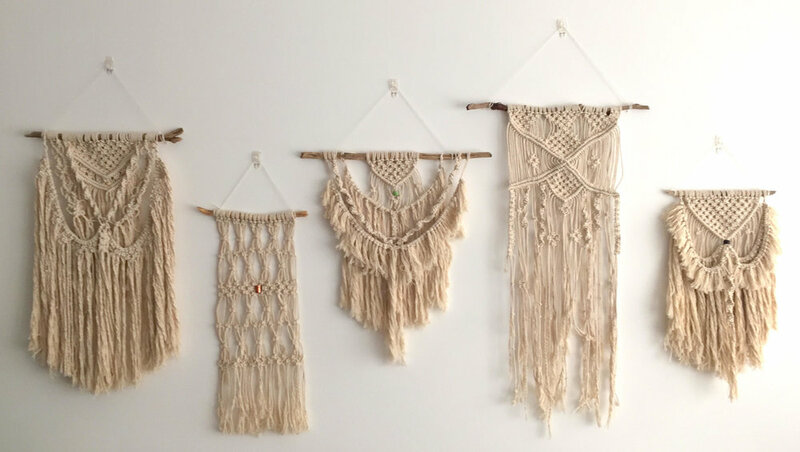 I've always been partial to a bit of macrame, and love a good wall hanging. And it just so happens that in the past couple of years, that kinda thing has become popular. It feels like everyone wants a bit of hippiness in their home. Scrolling Instagram one night, I came across the most beautiful weaved wall hanging. They came in an array of earthy coloured yarns, looped into driftwood. I was in love. Even better, the creator was an Irish gal based in Co. Waterford; Emma Carroll, who goes under the business name of Weaverella. Obviously I find some great pieces from international makers, but there's something so special about seeing one of your own building their own little creative empire. Supporting local is something I'm so passionate about and love knowing that a 'real life' person is hand-making something I'll keep in my home forever. And truth be told, if I'm going to spend money on something, I'd rather it go to someone who courageously risked the stability of a 9-5 because they love creating so much. I work freelance too, and know it's not always easy. But I also know that the support of others is appreciated so much more than you'd ever imagine. I caught up with Emma to ask her about all things Weaverella. It was such a joy to know that Emma puts so much thought back into the people who buy her creations, and really designs with a person in mind. And one I'd like to befriend at that! Read on to hear all about Emma's dreamy process. How did all this start? Was there one definitive “Aha!” moment that kick-started your career as a designer? "There was no real moment that kick-started it all. I'd seen some photos of wall hangings on line, I thought they looked cool and wanted to see if I could make one for myself. I didn't want to invest in a lot of equipment so I hammered some nails into a picture frame to make a loom, bought some cheap wool and went at it. The end result was TERRIBLE, so I decided to keep practicing until I made one I liked the look of. It took a while and I spent hours and hours practicing. Eventually, I got to the stage where I was happy with what I'd made, and by then I was hooked. I bought some nicer yarns, experimented with different techniques and kept on going. Suddenly I had a stock pile of wall hangings - that's when I thought about starting to sell them." "Because I'm relatively new to this (I started January 2016), I feel like my style is something that's developing all the time. I would say most of my work is quite floaty and bohemian and a little bit feminine which is odd because I'm none of those things! Recently, I've been experimenting with some bolder colours and I've been teaching myself to macrame which has been a lot of fun. It also means I've gotten to add some macrame pieces to the collection and I'd been wanting to do for a long time. My hopes are that my style will become more defined and focused and get to the stage where, if someone sees my work, they'll be able to identify it as a Weaverella wall hanging." "...fantasy versions of myself. I imagine myself as that bohemian girl in a floaty dress, walking barefoot on the beach and wonder what my bedroom would look like? Or I'm living on a ranch and I'm taking care of horses and cattle out in the dust, and I have this big log house and wonder how would I decorate it? Or I'm living in a huge plant-filled loft in the city and I host dinner parties and drink wine with my artsy friends and what would I have hanging over my sofa? Whenever someone buys a piece from me, I wonder if their life matches what I've imagined. I'm guessing probably not. Hahaha." Where and how do you get your inspiration? "I'm from Waterford and I live about 20 minutes away from the coast, so I grew up going to the beach most weekends, and I still do. I collect the driftwood I use there and it definitely is a huge inspiration for my work. I'm also inspired by places I travel to - there's a bit of a Californian bohemian vibe to a lot of my pieces, and some of the bolder coloured ones are inspired by time spent in Arizona or Montreal or Rotterdam. So really I'd say my inspiration comes from my surroundings and places I've been that are stuck in my head. " You probably have creative heroes who have inspired you. What characteristics would you like to be known for that may influence future designers? "That's a tough question! I think maybe I'd like to be known for being willing to try new things, and for always looking for ways to improve and expand. 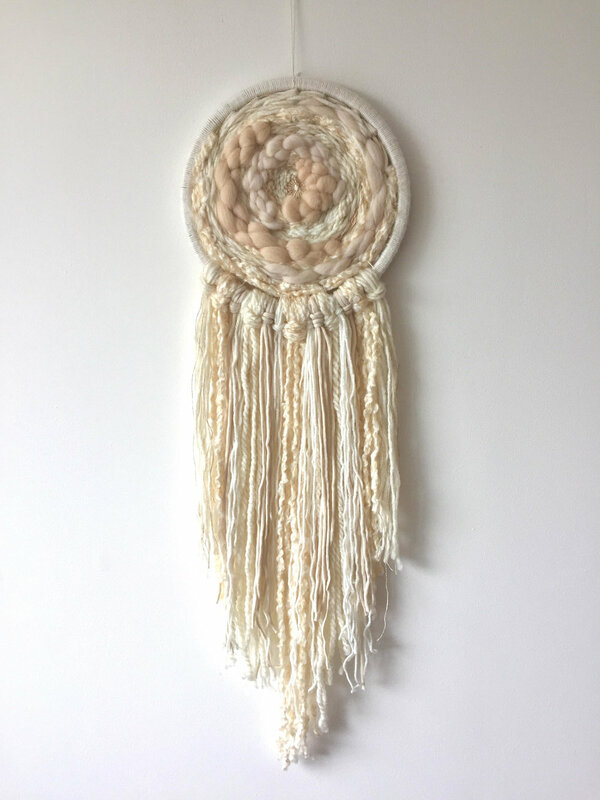 I really enjoy making woven wall hangings but now I also enjoy macrame, which brings a whole other look and feeling to what I do. A couple of days ago I started messing around with clay so maybe there'll be some clay pieces coming soon. It makes it fun for me to try new things and hopefully the end result will be a solid Weaverella collection of beautiful handmade items for your walls." "Unless I'm making a custom piece and the customer wants something specific, I tend not to make any plans or sketches and just go with whatever feels natural. I might have some colours in mind or some new yarns or techniques I want to try out, so I gather everything together, prepare the loom and go for it. If I do something and I don't like how it looks, I'll go back and remove it and move on." What are the main challenges you face as a creative? "Because the wall hangings I make are all handmade, one-of-a-kind pieces, honestly the biggest challenge I've faced so far is with pricing. Finding the balance between what you're happy to accept for the time and energy you put in and what the customer is going to be happy and willing to pay is always hard but I feel like I'm managing it. My pieces range in price from €20-€350 so I think there's something there for any budget." How do you define success? Do you feel you’ve found it yet? "For me success is in growth. Seeing my work go from that ugly first try to hanging in people's houses in Ireland and Australia and Denmark and the U.K. and all over the U.S. is amazing to me. Seeing my work featured on blogs and Pinterest boards and in magazines is fantastic. So far, I feel it's been a success and I'd like that to continue into the future." What has been the best advice you’ve both given and received? "There hasn't been one single piece of advice that I've given or received that stands out in my mind. However, I'm lucky to have a very supportive and encouraging group of family and friends, not only here in Ireland but also in Montreal and the UK, who I can turn to whenever I need advice about anything. I'm definitely a huge worrier so it's great to have people who understand that and know what to say to calm me down and spur me on in the right direction." Complete this sentence: “… makes it all worth it." "Seeing something I've spent hours working on hanging up and looking great and being enjoyed in someone's home makes it all worth it." Without art, life would be…? All photos by Emma Carroll and James Bradley. Check out more of Emma's beautiful creations on the Weaverella Etsy store right here.